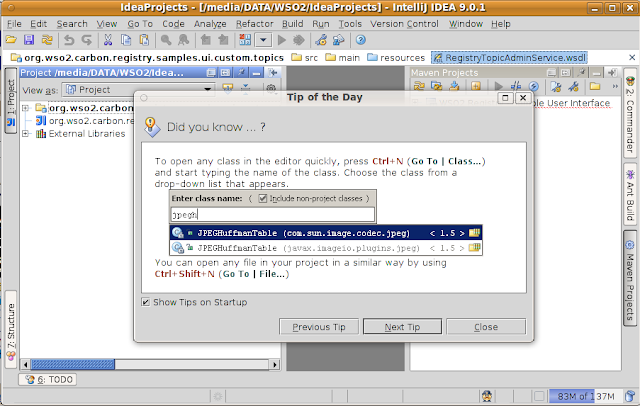 Here's a simple way to install IntelliJ IDEA on Ubuntu. I've done this on all Ubuntu Karmic Koala, Lucid Lynx and Maverick Meerkat. This worked just fine on Gentoo Linux too. It seems sun-java5-jdk is no longer available now. Refer Oracle Java SE Downloads for Linux and it's installation instructions. Keep the path in your memory; you'll need it when setting up $JDK_HOME path variable. if the version shows, then it is installed successfully. Add following for JDK_HOME to the file, make sure to change the path to reflect your java installation directory. Append the line for PATH variable with this, /usr/lib/idea-IU-95.429/bin . Finally, it should look like this. Now, run `source ~/.bashrc` to take effect the changes. If you have any problem in setting up this, drop a comment below. Well, even if you got right, just tell me so. Love to hear that too! :). Good Luck! Thanks a lot for this guide, it was clear and really helped. Welcome Isha, am glad to hear that it helped! Thanks a lot. Newbie to ubuntu and it helped alot. how to get JDK_HOME if i installed java erarlier and do not remember where? Or you can enter - `which java`. If it returned a path, check whether that's correct. If it's a link then enter the command- ls -al `which java` . These might help you locate the java installation location. "Append the line for PATH variable with this, /usr/lib/idea-IU-95.429/bin "
It's OK. You can simply add the needed command as it is. JDK Required: 'tools.jar' seems to be not in IDEA classpath.